MYRTLE BEACH SAILING SCHOOL is an American Sailing Association affiliate and offers year-round sailing certification instruction for individuals or couple/friends. All of our ASA courses are live-aboard programs which allow you to experience the enjoyment of living the complete "sailing lifestyle". Established in 2013, Myrtle Beach Sailing School is located in Little River, SC, just north of Myrtle Beach, allowing you to not only learn to sail in an ever-changing ocean environment, but also preparing you for coastal cruising by giving you the added benefit of learning the "rules of the road" while traveling the Intracoastal Waterway. Our Instructors are USCG Licensed, love teaching, and are passionate about sailing. Jason was born and has lived in Myrtle Beach for most of life, enjoying the multiple water-related activities that the area has to offer. After graduating from college in Atlanta, getting married, and starting a career in graphic & web design, Jason and his wife, Amy, decided to leave the “rat race”, get back by the ocean, and return to the Myrtle Beach area. Jason’s passion for sailing began years ago when his family purchased a 44′ CSY for cruising and chartering the local waters during the summer. Having learned the basics of sailing while crewing, Jason quickly fell in love with it and set his sights on getting properly trained and certified through the American Sailing Association, first as a student, then a few years later as a sailing Instructor. As part-time Captain of his family’s charter business, he decided sailing is what he wanted to do for his career, closed his web design business and began focusing on sailing full-time. 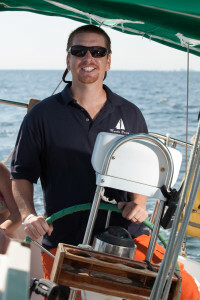 While chartering and teaching basic sailing skills to those interested, Jason decided to open Myrtle Beach Sailing School in 2013 and began non-certification instruction on Island Song, a 32′ Morgan 321. In 2014 he decided a more formal, progressive learning curriculum would be beneficial to his students and opted to become an American Sailing Association Certification Facility. Jason now spends most of his working time on the Atlantic teaching others the lifetime enjoyment of sailing, and delivering sailboats up and down the East Coast or to the Caribbean. In his spare time he can be found with his wife and two sons either sailing, fishing, playing at the beach, or participating in some other outdoor activity. Hi, I am Captain John. I began sailing in 1965 at the age of 10. A neighbor was selling an 11’ Sea Snark sailboat, I had earned and saved enough money from cutting lawns to buy it. As you can imagine the love of sailing grew from there. I was lucky enough to live a short distance from Lake Michigan and spent most of my summers sailing along the sandy beaches. Being the middle kid of 8 there was little privacy or quite around our home and sailing quickly became my love. I was fortunate enough to be selected as a crew member on a racing sailboat in Chicago at the age of 15. For the next 3 years I rode the train almost every summer weekend to participate in the races. You can consider me a heavy wind and sea sailor from my windy city training. I told myself that when I became a captain, I would be a cruiser not a racer. From my early days of sailing I loved the times that we relaxed and enjoyed the Magic and the subtle power of the wind. To this day even after all of the trips that I have made I still get a thrill out of casting off. Please give me the opportunity to share this wonderful love of mine with you and your family, I am sure that you will not be disappointed. Bill grew up around the water and on boats in southwest Florida and started sailing dinghies solo in open water at age 11. He chose a college, among other important reasons, for its location on the shores of Tampa Bay and for its strong sailing program. In graduate school, he hitchhiked on racing and cruising boats in Marblehead, MA on the summer weekends. 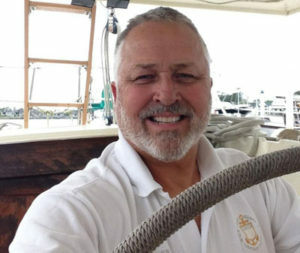 With decades of experience in sailing the Great Lakes, the Gulf of Mexico, the Chesapeake Bay, and the Atlantic Ocean under both sail and power, Bill has also skippered racing campaigns on the Chesapeake Bay, the Atlantic Ocean, and the St. Johns River in Florida; both around the buoys and offshore. Bill was elected Fleet Captain of the Columbia Sailing Association and spent two seasons setting CBYRA sanctioned races in the North Bay, and has 14 years as Captain of large ocean going passenger vessels both in Florida and in South Carolina. He holds his USCG Merchant Mariner’s License and his STCW95 Certification. 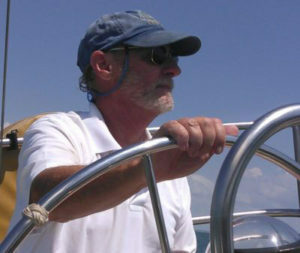 Bill brings many years of university teaching experience with decades of sail experience and ASA Instructor Certification to Myrtle Beach Sailing School, and is always happiest sharing his knowledge and love of the sea and of sailing. In his free time Bill still enjoys cruising the Atlantic coast while restoring his Cal 28-2.